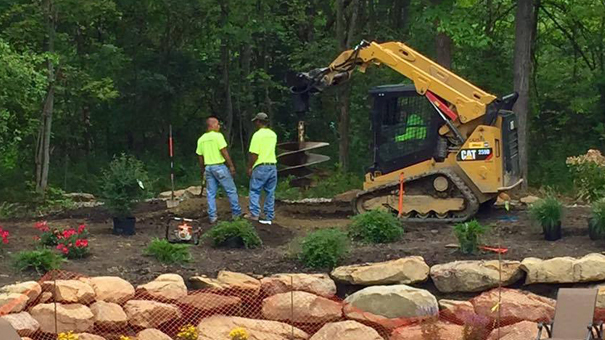 When you are having a new commercial building or home built in the Cleveland area, turn to Perfection Landscapes for all of your new outdoor construction landscaping needs. A new home or commercial property is a beautiful sight to look at. Have a professional Cleveland outdoor construction expert turn the outdoor area of your new property into an appealing environment which will compliment your newly constructed home or building. Perfection Landscapes understands this process and will transform your new property into a landscape ready area. Another problem which commonly occurs with new construction is drainage issues due to water being forced to or from places which was not present before construction began. Perfection Landscapes will correct any drainage and irrigation issues on your new property. Perfection Landscapes will work with your contractor and subcontractors during the construction process of your property. We will design a landscape plan for your budget and complete the project within your time line. Contact Perfection Landscapes for a Cleveland outdoor construction quote on your new construction landscaping needs. Over 400 Ohio Residents Have Perfection Landscapes, You Can Too! With our 10 years of experience we have had more than enough time to master the patterns of earth in Geauga. Working with Perfection Landscapes one thing you will notice quickly is the familiar faces. since staff turnover is low. Due to protocols and organization strategies we are able to get jobs done a lot quicker and a lot more efficiently. You don’t get to be the best Landscaping service without having some satisfied customers, guaranteed. Perfection Landscapes is waiting for your call or service request. We understand that time is important to you and vow to have your project completed on time. Contact Perfection Landscapes for all of your landscape design, maintenance, building and snow removal needs.